Tags are used to label your tickets. To learn more about how they function head over to this article here. If you are an Admin in your Gorgias helpdesk then you are able to access the tags from the Settings menu. 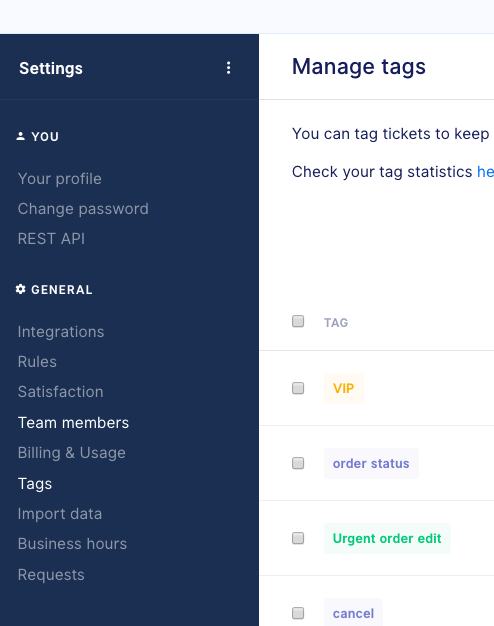 Within the admin access to tags you can edit, delete, add a description, and merge tags together. To access the tags go to Settings on the top left and then select Tags in the left navigation panel on the Settings page. By default the tags will sort based on which ones have been used the most. You can change this between ascending and descending by clicking on the column header "Tickets". You can also sort by alphabetical order and can also switch between ascending and descending. To sort by alphabetical order click on the column header "Tag". From here you can also edit or delete tags by clicking on "Edit" or "Delete" to the right of the tag. When you select "Edit" you are able to change the color of the tag, change the name, and edit the description. 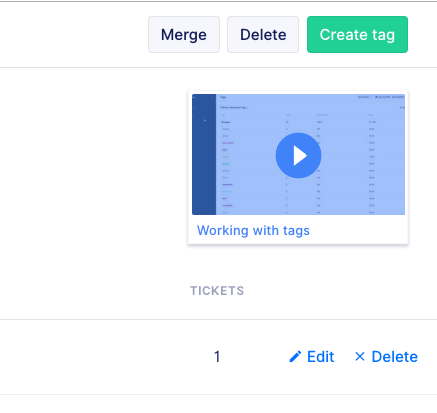 If you have two tags that function as the same label you can select the two tags using the check box to the left of the tag name and then merge them together using the merge button on the top right.